Promoter Bob Arum is still unable to explain why there are no tickets on general sale for the super-fight between Floyd Mayweather and Manny Pacquiao in Las Vegas on 2 May. The MGM Grand holds 16,500 but only about 1,000 tickets are expected to be made available to the wider public. 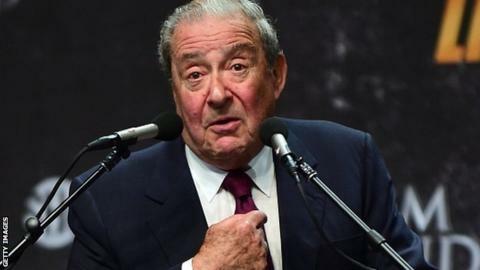 Arum cut a news conference short on Monday before questions could be asked. Meanwhile, it was announced on Tuesday that Kenny Bayless, who has refereed many contests involving Mayweather and Pacquiao, will be the third man in the ring on fight night. Bayless refereed his first world title fight in 1994 and is widely regarded as one of the best in the business. The judges will be Burt Clements, Dave Moretti and Glenn Feldman, whose first world-title fights were in 1989, 1981 and 1997 respectively. A representative for Arum, who handles Pacquiao only, said technical issues were to blame for the aborted teleconference, but Arum said he was unhappy with the number of journalists on the call. Another source close to Arum told BBC Sport that, contrary to reports, the ticketing problems have not been caused by Mayweather's camp. After the MGM takes its share of the tickets, each camp is allocated a percentage and is able to resell them to brokers at higher prices. Last week, Pacquiao's manager, Michael Koncz, accused Mayweather's camp of attempting to "manipulate the ticketing". It has been announced that tickets will eventually be on sale for between $1,500 (£1,000) and $7,500 (£5,040) but those prices have already tripled on the resale market. One broker, Precision Concierge New York, is selling tickets for as much as $87,500 (£58,630). Even if they were sold at face value, the gate receipts would be in the region of $72m (£48.3m), far surpassing the previous record of $20m for Mayweather's 2013 fight with Saul Alvarez. This year's Super Bowl took an estimated $71m. A representative of ticket search engine Seatgeek.com said very few tickets had been sold through the website so far, because buyers were unwilling to take the risk. Tens of thousands of tickets are expected to be sold for closed-circuit broadcasts of the fight at venues along the Vegas Strip, but no price has been set for them either. In addition, there have been a reported 15,000 requests for media passes, with most journalists not finding out until Thursday whether they will be accredited. The source close to Arum said he had not witnessed a fight build-up bigger than this in the almost 30 years he has been working in the sport. Boxing's last bona fide super-fight? Read more on Mayweather v Pacquiao: Boxing's last bona fide super-fight?